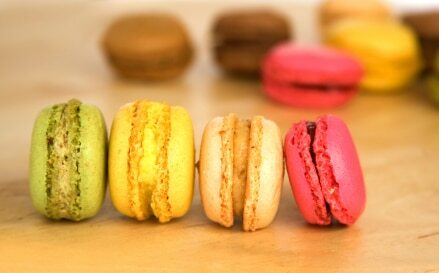 What Is The Difference Between Macarons and Macaroons? This conversation recently came up in the cooking ninja support group. I’d like to clear this up once and for all. A lot of people are confused about a basic question: what is the difference between macarons and macaroons? No, they are not the same thing! 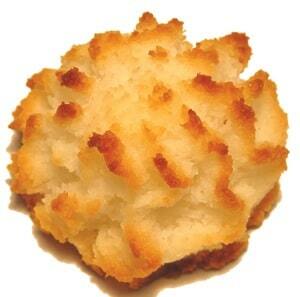 Macaroons, with two Os, are tender mounds of shredded coconut that generally have no filling at all. While both recipes are gluten free by default, they’re entirely different cookies. The sandwich-like French macaron is more of a meringue cookie, getting its light, airy texture from a combination of almond flour and egg whites that have been gently folded together. The Southern coconut macaroon, on the other hand, is a hearty lump of sweetness made of shredded coconut and condensed milk. While you can prepare coconut macaroons in about ten minutes, French macarons are generally more difficult to make – though not so impossible that they elude the home cook. Using a fine sieve, sift confectioners' sugar and finely ground almonds, pushing through with a wooden spoon. Using an electric mixer, whisk egg whites until foamy. Add cream of tartar and whisk until soft peaks form. Add sugar, 1 tbsp. at a time, and whisk until dissolved. Stir meringue mixture into almond mixture (mixture will be stiff), then halve. Tint one half pink, the other half orange. Spoon 1 mixture into a piping bag fitted with a 1/2-inch plain round tip. Pipe walnut sized rounds onto parchment paper-lined baking sheets, then repeat with other mixture. Set meringues aside, uncovered, on baking sheets for 1 hour (this will help minimize cracking). 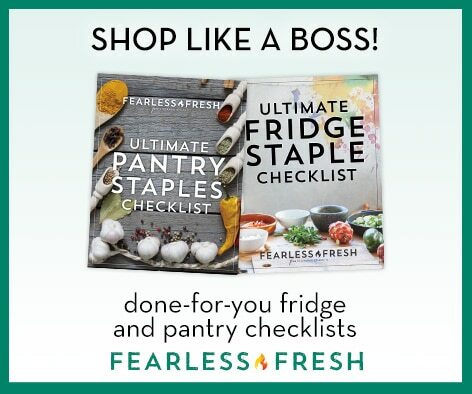 Preheat oven to 300°F (149°C) and bake macarons, 2 baking sheets at a time, swapping sheets halfway through cooking, for 20 minutes or until firm to the touch. Remove from oven and cool on baking sheets. 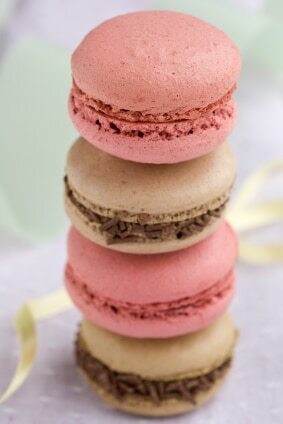 Slide a knife under each macaron to release from paper, then store in an airtight container until ready to fill. Using an electric mixer, beat butter until pale and fluffy, then gradually beat in confectioners' sugar until combined. Transfer half the mixture from the bowl to another bowl and add orange zest and orange blossom water. Stir to combine. Add raspberries and rose flower water to remaining mixture in mixing bowl and, using the electric mixer, beat until well combined. Sandwich pink macarons with raspberry filling and orange macarons with orange filling. Tip: To create a perfectly smooth top on your macaroons, dip a finger into a bowl of water and gently smooth out any peaks. Macaroons are tender cookies made of shredded coconut and condensed milk. Preheat oven at 350°F (176°C). Generously grease two baking sheets, or use silicon baking sheets. Combine all of your ingredients and stir until completely blended. Drop by teaspoonfuls, 1-inch apart, on prepared baking sheets. Gently press down with the back of your spoon to give them a uniform shape. Bake for 15 minutes, or until cookies are golden brown. Allow to cool before removing from baking sheet.